A 31-year-old man is in a critical condition and four others are injured after a car crashed in to them in south-east London, police have said. 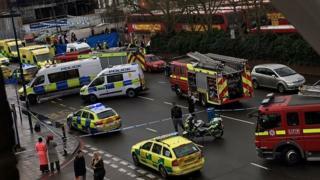 The five pedestrians were hit by a Mercedes on Bromley Road in Bellingham just before 08:30 GMT. A 35-year-old woman and another 25-year-old man initially described as being in a critical condition are now stable, as are two men aged 36 and 46. The driver of the car was arrested on suspicion of drink driving. He was also arrested on suspicion of causing serious injury by dangerous driving before being taken to a south London hospital with a head injury. An off-duty police officer carried out the arrest. London Ambulance Service said it treated the pedestrians for a range of head, chest and leg injuries before taking them to hospital as a priority. Bromley Road, from Crantock Road to Bellingham Road, has now been reopened by police. On Facebook, one person wrote: "Big car crash on bromley road... tons of police, ambulances, even helicopter landed in pc world... my thought and prayers are with them." The crash was near a car wash, opposite a row of shops. Witness Raee Towolawi, 26, was on her way to church with her mother, brother and sister, when she heard screaming. She described the scene as "carnage". "There were two men lying flat on their backs, just lifeless or unconscious," she said. Ms Towolawi added: "I thought they were dead. I was just shocked and couldn't believe what I was seeing. "I didn't notice the car until I came back afterwards. I just thought they'd been stabbed or shot." The car appeared to have left the road and crashed into the end of a hedge. Its bonnet and boot were popped open by the impact and its airbags were deployed. Debris, including a bollard, was strewn across the pavement. Anyone with information has been asked to contact police.